Post-Human Computation is featured at the South East Asian on November 21 at 3 and 7 PM Arts Festival. The piece is played in conjunction with the installation and performance Inside/Outside at Goldsmiths, Studio 1, Richard Hoggart Building. The two works were also performed at the Audio Art Festival in Krakow on November 18, 2015. The tour with The Six Tones and Matt Wright continues to the Sidney Cooper gallery in Canterbury, opening on Nov 25. The piece will be released on DVD in November 2015 by éole records. Two excerpts of that recording can be seen following this link. The starting point for this piece was a proposal from the guitarist Stefan Östersjö to take part in the “Inside /Outside” project in collaboration with the Vietnamese/Swedish group The Six Tones. This ensemble consists of two Vietnamese traditional musicians as well as Stefan himself. In this project, they perform in glass boxes and the audience can look at them, listen to what they are playing separately “inside” of boxes as well as listen to a quadrophonic soundscape in the room, mixed live and with real-time sound processing. When I first discovered this project I was deeply interested in the question of the “viewing process” and in some kind of reality transgression. Therefore, I proposed to Stefan to work on some kind of extension of this situation where the two traditional musicians would become virtual, as a part of a film, while he would perform live on electric guitar. Here also, the question of “viewing” and the gaze of the audience is essential and creates some special relations between the live performance and the imagery. When I started to shoot the video, I firstly focused on the traditional instruments, trying to catch some special matter with close views and contemporary playing techniques. But quite soon, I also became concerned with more overarching questions, especially how, we as occidental, consider the oriental culture. I started to see those two women musicians as some archetype of Asian culture and I decided to look deeper into this subject. 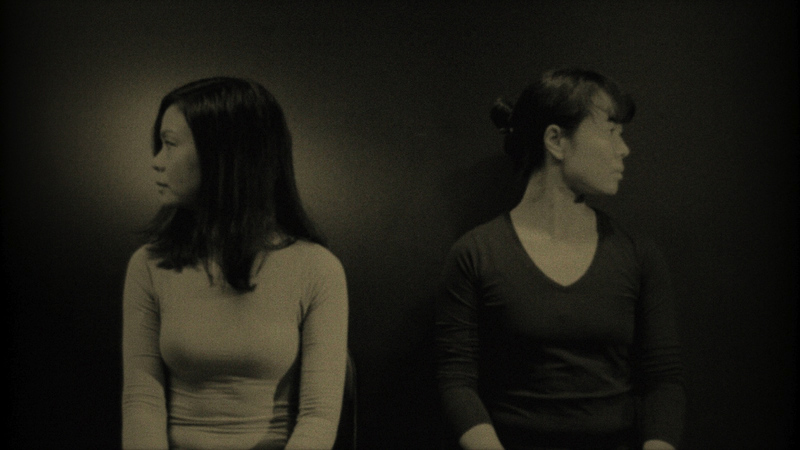 I did some research on the status of women in Asian countries, investigating their role in industrial production, army, entertainment etc… and I found some pictures on internet that I decided to include in my film editing as a reflexive counterpoint. I was thus digging on internet and collected a lot of pictures that I included in my editing. I reached some strange world, a strong distortion of perception, where everything you see seems unreal. Some kind of post-human situation, totally out of control. Finally, those two traditional musicians, Ngô Trà My and Nguyễn Thanh Thủy, appear in this film as “simple characters” who look at us or, in a permanently shifting viewpoint, who are the ones we look at. Traditional instruments (as pictures or sound) appear here and there as some relic of a lost world, recovered now by something else, much different. In the film, we can observe also two landscapes (in the middle and at the end of the piece). They should bring us “outside” but here again they bring us to some strange reality. Indeed, those two very slow journeys are not real at all. I made them artificially from still pictures but I tried also to preserve some strong ambiguity… The first landscape is a view of an abandoned factory in Detroit, a symbol of economical collapse. 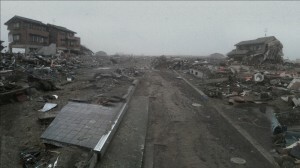 The second is a montage of a devastated village after the tsunami in Fukoshima, a symbol of ecological collapse. Disaster here creates another disaster there… maybe these are now the relations between occident and orient? The musical layers have been composed as a counterpoint to the rhythmical patterns created by the imagery. The music can be minimalistic or very dense, sometimes quite independent from the video, sometimes precisely synchronized. 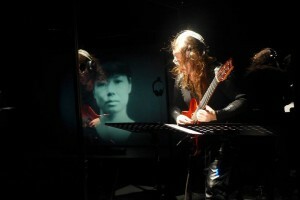 The soundtrack uses a mix of traditional sounds, sound synthesis, electric bass and percussion and the guitar part includes a few typical Asian style techniques but more often a heavy rock sound… But beyond the music, the situation itself should be constantly stimulating through the relations which occur between the real gesture and presence of the musician and the mutating state of matter in the video. And in such a world, we can also ask ourselves the question what really remains from guitar hero? This piece is dedicated to Stefan Östersjö who took the first step to to initiate this project and trusted my intuitions. And also to Ngô Trà My and Nguyễn Thanh Thủy, who accepted to present themselves not only as the fantastic musicians they are, but also as simple (and true !) human beings. Watch a short preview of the piece here.